We learn to practice nonviolence one step at a time, one choice at a time, one day at a time. This is how each of us, in our own way, move the world in the direction of peace through daily nonviolent choices and actions at home, at school, in the workplace and community. 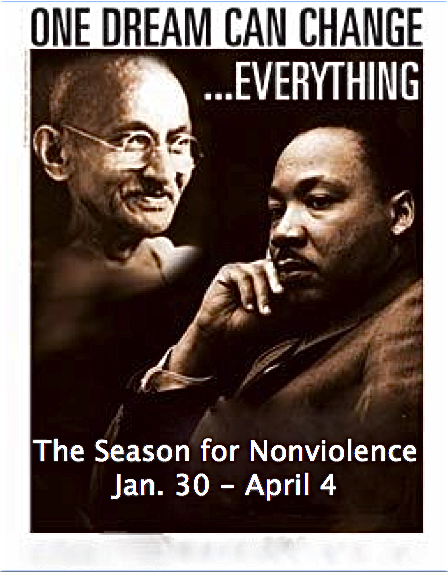 This is the Season for Nonviolence. The Gandhi King Season for Nonviolence commences on January 30 and marks the 64 calendar days between the memorial anniversary of the assassination of Mahatma Gandhi and that of Dr. Martin Luther King Jr. on April 4. This annual campaign was co-founded by Dr. Arun Gandhi, Mahatma Gandhi's grandson, and The Association for Global New Thought. Individuals, schools, and organizations in 900 cities in 67 countries have participated since the campaign began in 1998. The objective is to create an awareness of nonviolent principles and practice as a powerful way to heal, transform, and empower our lives and communities. It is, therefore, the purpose of the Season and the following 64 Daily Practices to educate and inspire individuals and organizations alike to actively seek out nonviolent means by which to empower themselves and others to co-exist in peace and prosper together in community.